You won’t trust your home to just anyone, and who could blame you? Your home is supposed to be your castle – it’s the place that you go to unwind at the end of a long, busy day. It’s a place for family and friends to congregate and spend time together. When something goes wrong, you want to find a Glen Burnie handyman who you know you can trust to take good care of your home and get the job done right. You might have to do some digging to find someone who is compatible with you that you’re willing to let work on your home. Read on for a few tips for finding the perfect handyman! Where Do I Start My Glen Burnie Handyman Search? Do some research – Start by checking online and talking to your friends in the area. Your friends will have firsthand experience and be able to give you some good recommendations. Be careful when you’re looking online. Most of the time you’ll find negative reviews because the people who review most often are those who have big problems. Check sites like Angie’s List and Yelp. They’ll usually be able to give you a good idea of local handyman services. Do an interview process – After you’ve done your research and narrowed down your favorites, you can start interviewing your final candidates. It’s a good idea to get your Glen Burnie handyman pool down to 3 so you have a good amount of options, but not too many. Ask them the important questions. 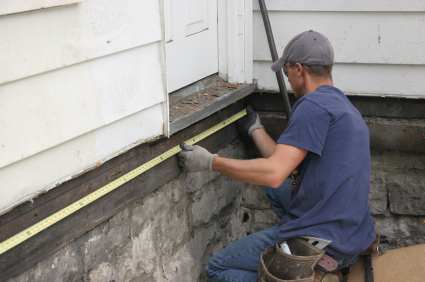 Do you offer a free estimate? What kind of projects do you usually do? Do you have some references that I could speak to? Make sure you get the answers to the questions that are important to you. Review your candidates – Go over all of the estimates that you’ve been given. Check them thoroughly to make sure that you have itemized lists and a good understanding of why each dollar is being spent. If you made notes while interviewing, now is a good time to review those, too so you can keep tabs on your feelings about the handyman as well. After reviewing everything that you have and making sure that everything checks out like it should, it’s time to do some hiring. Make sure that you aren’t paying for your whole venture up front. A good handyman will never require upfront payment. Whether you need carpentry repairs, caulking, rental renovation, roofing, siding, gutters, or you have small problems, Atlantic Maintenance Group has you covered on handyman services. Give us a call at 410.768.4720 or visit the website today to get your free quote! This entry was posted on Thursday, July 24th, 2014	at 3:30 pm	and is filed under Blog	. You can follow any responses to this entry through the RSS 2.0	feed. Both comments and pings are currently closed.